Weighing in at just two ounces, this lightweight L.E.D. model has plenty of power to light your way. 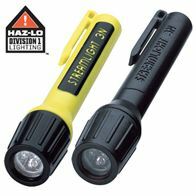 It features three super-bright, 100,000-hour LEDs which allow its battery to last 20 times longer than standard flashlights. Momentary "blink" or constant "on" tailcap switch. It has a Integral Pocket Clip & is constructed of impact resistant polymer with a rubber face cap. Depend on it to provide up to 120 hours of run time.